That's the idea behind the Adopt-A-Waterway Program. The City of Colorado Springs Water Resources Engineering division encourages local businesses, civil and professional organizations, environmental groups, academic institutions, neighborhood groups, and other community-minded organizations to formally Adopt-A-Waterway for the purpose of protecting and improving water quality. Must adopt at least a 1/4 to 1/2 mile stretch of creek or stream. Larger reaches must be approved by staff. Agrees to coordinate the group's activities with the City's Project coordinator. Agrees to all safety requirements. 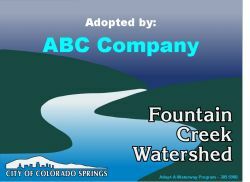 The City of Colorado Springs will recognize adopting groups by providing signage for the adopted waterway. The City also provides trash bags, trash pick up, safety vests (if needed), and other support necessary to adopting groups.